FAST WordPress Support Ticket Plugin offers a complete support solution for your business and it’s super FAST! A customer that is kept waiting is an unhappy one. FAST is so fast it’s just like chatting to your customers. 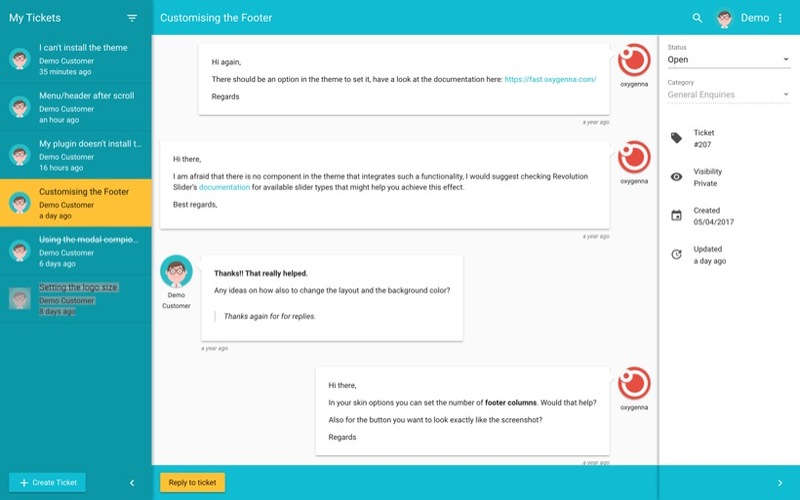 FAST is also super customisable, use it for handling general enquiries, product support, WooCommerce order support or Envato Marketplace support. Save yourself $$$ by using FAST! No need to pay for a subscription to a support service. FAST runs on your WordPress server with any theme! Also unlike other available plugins where you have to pay $$$ for add ons / extra features, FAST has no hidden extras. It’s the complete package! Customizable Ticket Fields – Add your own fields to get more information from your customers. Saved Replies – Save your most common replies for quick responses. FavIcon Counter – Just look at the browser tab to see if you have tickets that need a response. Verify Envato Purchases – FAST will show you if all your customers purchase information. View Envato Support Period – Make sure your customers still have support for your product. WooCommerce Support – WooCommerce customers can create tickets using their WooCommerce account and order. Email Notifications – Customers & Agents will recieve an email when their ticket has a response. Email Piping – Respond to tickets using only email!